Understanding the dynamics of Twitter and how people use it can mean the difference between a failed promotion and one that actually meets your goals. 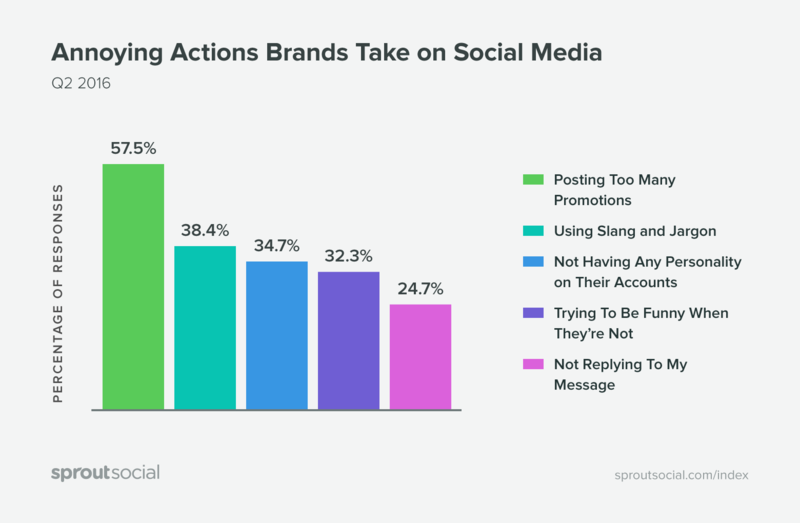 Twitter’s conversational nature makes it ideal for brands that want to build relationships with their audience rather than just broadcast their message. Know your audience: First and foremost, you have to know who you’re talking to. Otherwise your messaging won’t connect. Your copy, graphics and tactics you choose will all depend on who your audience is, so make this a priority. Luckily finding this data is pretty simple with Sprout. 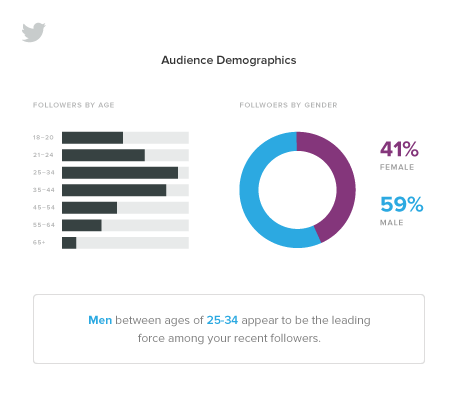 We have a report that breaks down the demographics of your Twitter followers. Set your goal: What’s the purpose of your Twitter promotion? Do you want more followers? Are you trying to grow brand awareness? Or maybe you’re trying to sell more of your products. Whatever your reasoning, attach a goal to it so you can accurately measure the success of your promotion. Timing: Sometimes it’s not a matter of what you do, but when you do it. One of the tips you’re going to learn in this article is the power of running timely Twitter promotions. Planning ahead and launching your campaign at the right time can significantly increase your chances of success. Strategize: Celebrities and extremely large brands are known for doing spur of the moment Twitter promotions like a surprise live stream or giveaway. And while sometimes these are done off the cuff, the reality is there’s often strategic planning going on behind the scenes. Instead of relying on the power of spontaneity, build out a strategy for your promotions. Provide value: This goes back to understanding who is your target audience. In order for people to feel engaged and compelled to participate in your promotion, you need to provide some kind of value. When your promotions are purely self-serving or are about something your audience doesn’t care about, it’s difficult to build the amount of interest you need to be successful. If you can nail those elements, you have a much better chance of being successful. The last step in the process is the execution. Even well planned campaigns can fall flat if they’re not put into action properly. In order to help you out, we’ve compiled a list of tactics to help make your Twitter promotions a success. Give any of these strategies a try the next time you want to get your message out with a Tweet. Twitter contests are tried and tested. People like free stuff, so a giveaway or contest is great tactic for Twitter promotions. But if you want to get more than just freebie seekers, you have to be strategic with your approach. Make it simple to enter: The more complicated it is to enter you contest, the less likely people will be to participate. It should be clear what people have to do to be eligible and the entry process should be smooth. For instance, you could require people to follow you and Retweet your contest. Integrate UGC: Getting people to submit user-generated content as a part of their entry helps build buzz as well as gives you more content to share. Follow the rules: Twitter has guidelines for promotions that brands have to comply with to avoid getting shut down. Make sure you read through the list and understand what your brand can and cannot do. Choose a good prize: Pick a prize specific to your company or industry. When you give away prizes like televisions, money or general gift cards, you open the door to tons of freebie seekers. On the other hand, when the prize is a gift card to your own company, you can potentially earn new customers because they’re going to be visiting your website or store. Is your Twitter bio a short sentence about your company and nothing more? If so, you could be missing out on a big opportunity when you’re running promotions on Twitter. Even though the space in your bio is somewhat limited by character length restrictions, you can still get plenty of use from it. You can use your bio to promote specific campaigns you’re launching, your top content or even a landing page. 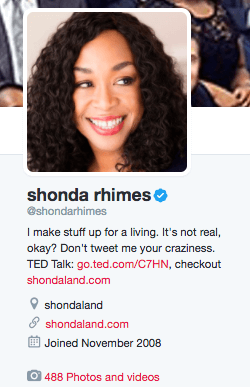 In addition to a quirky description of what she does and a link to her website, TV producer Shonda Rhimes uses her Twitter bio to push traffic to her TED Talk as well. You have the ability to add links within your bio beyond just the URL slot Twitter gives you. Use it as an opportunity to link to your current promotions or an event. If you’re linking to a page on your website, use a trackable URL so you can attribute traffic from your bio. Check out our UTM tracking guide to find out how to set it up. According to one case study, Tweets reach about 3-4% of your audience. With all the content flowing through Twitter, it shouldn’t be too surprising that your Tweets aren’t being seen by all of your followers. One way to help boost those numbers a bit is to use promoted Tweets. Promoted Tweets allow you to pay to get your Tweets in front of a targeted group of users. Not only can this improve your reach with your own audience, but it also gives you the ability to be seen by accounts that aren’t following you. There are a few different approaches your brand might take. One is to create a promoted Tweet specifically for a campaign. You’d write out new copy for the Tweet and chose a matching creative. Another option is to promote one of your existing Tweets to give it more exposure. You can look at your Tweets that have seen some success in the past and amplify them with a paid campaign. 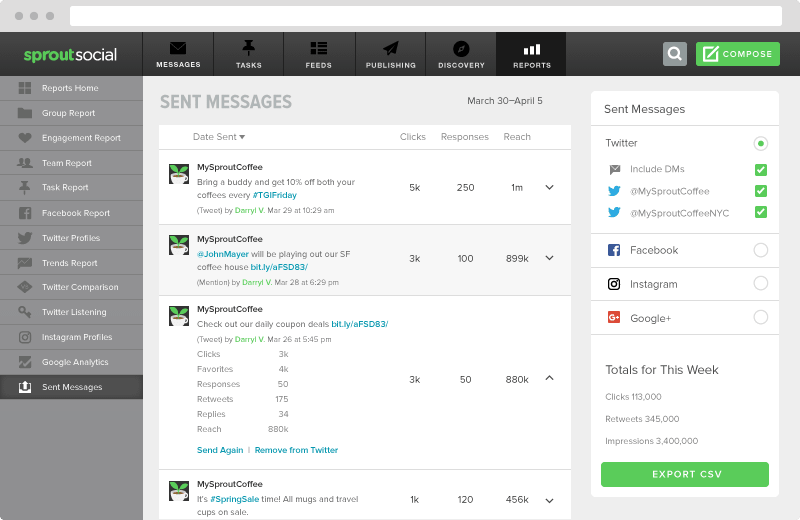 If you’re a Sprout user, you can start by heading into your Sent Messages report. This will show your Tweets with the most engagement. Tweets with the most clicks, responses and replies are good options to promote because they’ve already proven to be popular. Then you can replicate the Tweet or try to create something similar. One of the advantages you’ll have this time around is the ability to target who sees the Tweet. If you’re new to the world of promoted Tweets, check out our beginner’s guide to Twitter advertising. You want to get the word out about your campaign, but it’s easy to go overboard and get a little spammy. Reaching your audience without becoming annoying can be quite the balancing act. According to our Q3 2016 Index, 57.5% of users are annoyed by brands that post too many promotions. To avoid annoying your audience, keep promotional Tweets to a minimum. Just like with any other social network, your top priority on Twitter should be to provide value. So a majority of your Tweets should serve that purpose, rather than strictly focusing on increasing your bottom line. There’s no magic ratio of promotional to non promotional Tweets. It’s something you’ll have to test with your audience to find out what gets the best reception. Live video became wildly popular in 2016, and continues to be one of the top social media trends of 2017. While Facebook and Instagram Live tend to get a lot of the attention, Twitter has been on the live streaming wave for a while. In fact, they were so confident in live streaming early on that they bought Periscope in 2015 before the app even launched. Take advantage of the live streaming movement by using Periscope to host Q&A sessions, events or just to chat with your followers. Periscope streams appear in your followers’ feeds and tend to stand out more than an image or text. To increase your viewership, consider adding #Periscope to your Tweet and hold it during a time your audience is most likely to be able to attend. Don’t be discouraged if you don’t have hundreds or thousands of people viewing every time. Focus on making each session as entertaining and valuable as possible for the viewers you do have. Here are a couple examples of companies that have seen some success with Periscope. Fashion brand Louis Vuitton used Pericope to give followers a peek inside its Men’s Fall-Winter 2017 Fashion show. Adidas UK broke into Periscope for the first time early this year by live streaming their #TLKS open-source talk series. Both Louis Vuitton and Adidas show how powerful Periscope can be when promoting an event. Think of creative ways you can integrate Periscope into your Twitter promotions and go for it. One of the best things about planning your Twitter promotions ahead of time is you have the ability to strategize for different seasons. You may want to run certain promotions during the Summer or maybe something special during the New Year. For instance, for the New Year, we ran our Sprout Goals campaign on Twitter. We asked customers and followers to share their goals for 2017 using the hashtag #SproutGoals. Promotions like this are great for getting your community active and creating plenty of user-generated content. Another benefit of running seasonal Twitter promotions is you have a chance to jump on board trending topics. During holidays or other timely events, there’s generally a trending hashtag that goes along with it. Not sure which hashtag to use, or what holidays to pay attention to? We’ve done the heavy lifting and created a hashtag holiday calendar that you can download or add to your Google Calendar. Start planning your promotions ahead of time so you can get graphics, copy and other materials ready. It’ll make your life much easier. Who says you have to go solo into Twitter promotions? Partnering up with other brands on Twitter is a great way to get exposure to a new audience and make connections. There are a few different approaches you can take. One popular tactic is to host a joint Twitter Chat. For example, for our weekly #SproutChat, we sometimes partner up with other brands and social media influencers. Come up with a topic that both audiences would be interested in, and do plenty of promotion for the chat before it starts. Joint Twitter Chats are a win-win situation for both presenters. Each gets exposure to the other’s audience and you can use the chats as a way to approach new brands you’re interested in working with. The very last step in the process is to get started. Use the tips and strategies we’ve outlined for your next Twitter promotion. Don’t forget to track your progress. You can use Sprout’s Twitter analytics to measure the performance of your Tweets. Find out what works, what doesn’t and make improvements for next time.